1 Autograph or Memorabilia Card Per Pack! 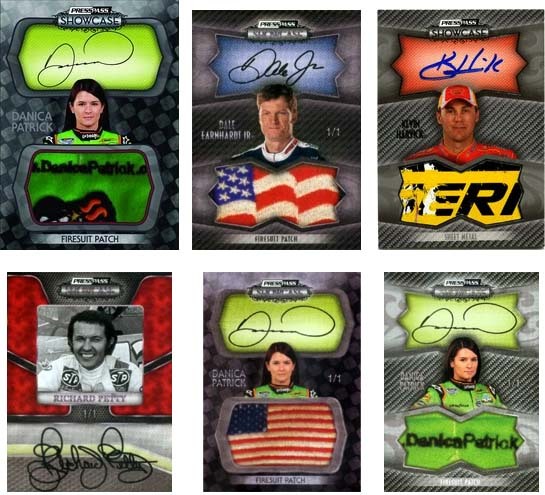 Each 1/2 Case will include a Danica Patrick Autograph or Memorabilia Card, a 1/1 Autograph or Memorabilia card, and an "instant win" race used memorabilia! Premier Prospects SP Danica Patrick Rookie Card! "Classic Collection Ink" multi-driver autographs! Racing's Finest Autographs - 12 old school drivers including Richard Petty! Dale Earnhardt Sr. race car sheet metal used in August 28th, 1999 win at Bristol used in relic cards! The piece of sheet metal was taken from the dented bumper of Dale's car that controversially "bumped" Terry Labonte out of first place during the race's final stretch.